St John USVI is the beautiful gem of the U.S. Virgin Islands. It's a place where spectacular beauty entrances you at every turn. St John is the smallest of the U.S. Virgin Islands, and the least populated by far. It has less than one-tenth the population of either St Thomas or St Croix . But what really sets St John apart from the other Virgin Islands is the fact that nearly two-thirds of the island is protected by the Virgin Islands National Park. That means that most of St John is completely free of development. It's a place where you can enjoy the natural wonders of the Caribbean. The island is absolutely enchanting. I've heard people who've traveled all over the world say that St John is the most beautiful place they've ever seen. And I believe them, simply because I can't imagine anywhere more beautiful! The only way to get to St John is by boat, since the island has no airport. There's regular ferry service hourly from St Thomas to St John's principal town, Cruz Bay. When I first came to St John over thirty years ago, there was just one resort and a couple of campgrounds. These were the only accommodations, besides a few private homes for rent. The island's fantastic natural appeal has changed that in recent years. You'll find plenty of places to stay on St John these days, including resorts, condominiums, and private villa rentals. 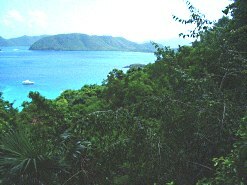 Much of the island outside of the National Park has experienced development. The steep, lush green hillsides are dotted with homes now. Cruz Bay, on the island's western tip, wasn't much more than a dusty crossroads a generation ago. Now it's a bustling, lively little town, full of good restaurants, shops, and vacation rentals. Although it's not as developed as the other Virgin Islands, there's still plenty to do on St John USVI. Actually, it's the very lack of development that affords some of the best opportunities. Exploring nature is certainly one of the most popular. The island has a great selection of hiking trails. From these, you can explore the coastlines or up the deeply forested mountainsides. The views from various high points on St John must be among the best anywhere in the world! Many of these are accessible from scenic overlooks on the roads. Others are placed along the hiking trails. From these points, you get spectacular views out over the sea. Another attraction you won't want to miss is the historical sights. Annaberg is the remains of an 18th century Danish sugar plantation. Annaberg is maintained by the Park Service, with a walking tour and signs that describe the different facilities that made up the sugar works. You'll encounter many plantation-era ruins around St John USVI. In the island's interior you can explore mysterious stone carved petroglyphs left behind by unknown native people. You'll also find a full range of water-sports on St John USVI. The snorkeling here is fantastic. A number of the island's fabulous beaches have excellent snorkeling just feet from the shore. You can also windsurf, sail, kayak, and scuba-dive during your stay. Of course, the beaches on St John are amazing. Several are ranked among the best in the Caribbean. One of my favorite things to do on St John is just to drive around on the island's steep, windy roads. There are just a few roads on St John. One runs from Cruz Bay north along the coast, past several of the island's best beaches. This road offers some absolutely breathtaking views from its scenic overlooks. You'll be driving along a steep, windy road, through dense, lush tropical forest, and suddenly a spectacular view out over the sea will burst into view. St John's other major thoroughfare, Centerline Road, leads from Cruz Bay eastward through the heart of the island. This road leads to St John's second town, Coral Bay, a quiet little hamlet on the eastern side of the island. There's a fabulous harbor here which makes it very popular with the sailing crowd. Past Coral Bay, to the southeast, you'll find the island's driest terrain, where you can see cacti and acacia trees growing in the arid soil. The southeastern section of St John USVI is where you'll find some of the most isolated, unpopulated beaches. If you're looking for that "away from it all" feel, try this area! 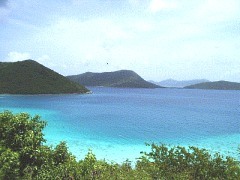 The truth is, no words can adequately describe the phenomenal natural beauty of St John USVI. It's the kind of place that's addictive. However much time I spend on St John, it's always too short. When you visit St John, you'll know what I mean. It's just that enchanting.